This time of year, when our harvest comes in, is a real blessing. Even with the cold, wet summer that has kept our tomatoes from being a nice ripe red, we still feel very grateful for the bounty. 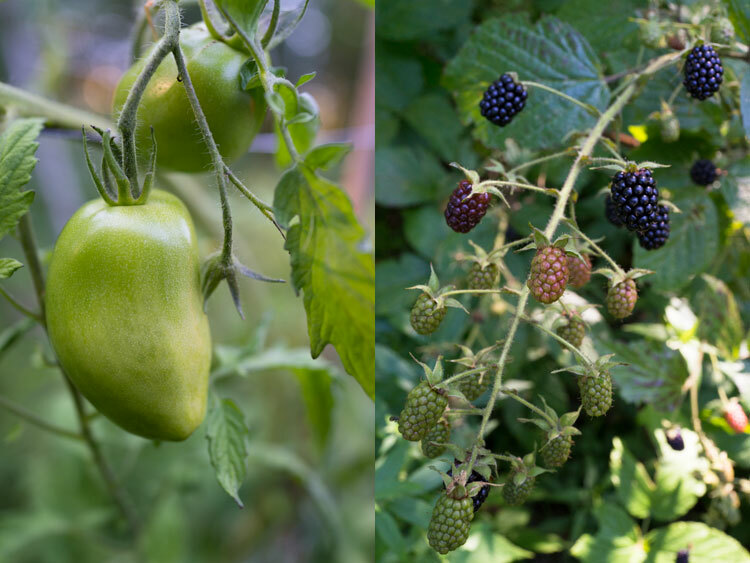 Our largest and most anticipated crop is our blackberries and black raspberries. For three to four weeks, we will collect three to four pounds of berries every other evening. The scars and wounds the thorns leave on my arms are a small price to pay for this fruit. Not only will this provide fresh food for our breakfast and dinner table for the month, we will freeze a good portion which will last well into the new year. The amazing thing about blackberries, beyond the terrific yields, is the carefree nature of the plant. They do as well in the shade of our forest as under the bright sun in our field. They are not fussy about soil type. They can dry out under the sun, but once they establish a good ground cover, they can protect themselves. Our field briers provide habitat for beautiful orb-weaver spiders as well as bedding and shelter for the local deer. But the blackberries signal for the end of this season in Maine. These plants project the wisdom of age, contrasting their explosive and impetuous growth of spring. They lead us gracefully out of the last stage of summer—their yellowing foliage on the canes anticipate that of our trees and the approaching winter.